A lovely property, beautifully renovated to a very high standard, by the owner, with solid light oak floors and lush cream carpets, solid light oak doors throughout, modern bathrooms, a contemporary kitchen and an amazing garden. 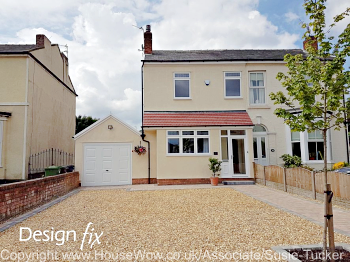 The owner wanted to increase the chances of selling by styling the property, but on a small budget. 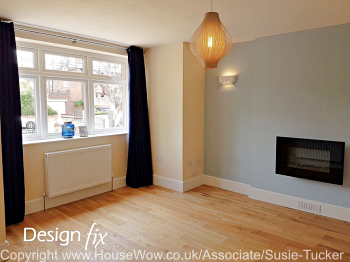 We opted for a contemporary pale and midnight blue colour scheme to enhance the existing neutral decor. We dressed the windows with either curtains and poles or with wooden blinds to match the woodwork; painted feature walls in 3 of the key rooms; added ceiling lamp shades and accessories throughout the property with artwork. The property sold for the asking price to the 4th person that viewed it, apparently achieving the top selling price for a 4 bedroom property on that particular street. I certainly pays to maximise your chances of a sale. 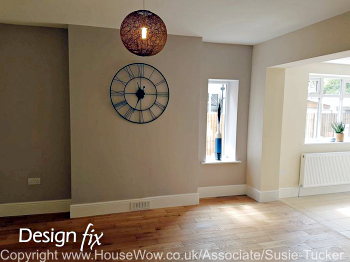 "Making an unfurnished property appear as more than a series of empty rooms requires a special talent and Susie's ideas and suggestions literally transformed my house. Everything we discussed at our first meeting was duly delivered and installed by Susie on time and even slightly under budget. 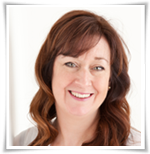 Asking Susie to put the finishing touches to my refurbishment project was one of the most important decisions I made and I am happy to recommend her services." Ian F-S, Southport.